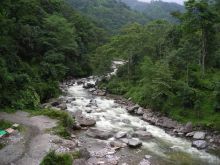 Sikkim is a completely hilly state is having a variation of elevation in the range of 440 mt to 8540 mt. and measures about only 110 km from North to South and 64 km from East to West with three international boundaries, Nepal (100kms border line ), Bhutan (30 kms border line) & Tibet (220 kms border line ). In the year 1975 through a general election Sikkim had been included as 22nd state of India. Despite having 0.22% land of the country it boasts for rich flora & fauna with beautiful streams, waterfalls, spring, lakes, glaciers & mountain peaks. 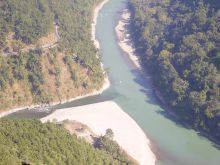 Mighty river Teesta which is the lifeline of this state cuts through Sikkim from North to South makes the state more beautiful. 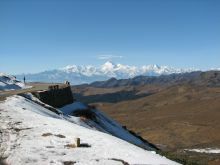 Sikkim plays a very important role for the growth of tourism in India. Politically Sikkim is divided into four major districts East West, North & South. But each state is having the same importance from tourism point of view. One thing always should keep in mind for Foreign National Tourists as they required special Inner line Permit for maximum Fifteen Days issued from Indian Embassy or Government of Sikkim. Roaming in this tiny hilly state is very easy and safe, even visitors can walk around with their family in the night. People are very helpful and simple. Bonvoyage Leisure offers Sikkim tour and travel packages, complete information of holiday destinations in Sikkim, luxury - deluxe - standard hotels and resorts booking with complete tour itineraries in Sikkim. Bonvoyage Leisure also offeres holiday packages with best hotel packages, car hires, local sightseeing, trekking in Sikkim. All rights reserved Bonvoyage Leisure Pvt. Ltd.
Website Design & Development by Techno Developers Group.